Here´s the deal, in this topic everyone could tell us all about songs or albums with special memories attached to them. How´s that sound? and this memory is about summer nights. This goes back to 1994 and 1995, I was 14/15 years old during those times. 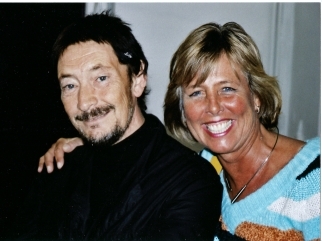 and I used to listen Best Of Chris Rea collection, the first record I knew from him. and still rather warm weather. Songs like Road To Hell, Josephine and Let´s Dance playing while cycling and it felt like the best moment in a day, you could felt being free, no worries, all joy. I've told this here before I'm sure but I have many memories around various C.R. albums but 2 stand out. I met my wife in 1988 and we were on our 1st date when I put On THe Beach in the cassette player in my car. She could not believe what she was hearing and loved every song.At the end of our date she took the tape as she left my car so I knew I'd see her again.I was right as we moved in together 2 weeks later (I think it was the album) ! I was in downtown Vcr. and went into Virgin records (they've since left the Canadian market).They usually only have a couple of C.R. albums (CD's) and there it was Dancing Down The Stony Road ! I called my wife and told her about my find and she made me promise not to open it till I got home.WE sat down on our back deck with a couple of bottles of very nice red wine on a hot summer Friday night and listened to this FANTASTIC CD several times that night. When Lily e-mailed me about the possibility of this concert I started smiling from that moment on ! When I was confirmed as going you could not wipe the smile from my face for weeks. Indeed a wonderful idea, this topic! I have told my story many times but perhaps in short here as well. I have special memories to (almost) all songs on the Auberge album (specially Auberge, heaven and Set me free) as this was my introduction to Chris Rea. I had bought the cassette in Hungary while on vacation with my mother and my aunt and on the (long) way back to the Netherlands I pursued my aunt (who was driving) to keep on playing this cassette... So when I hear these songs, I always go back to the back seat of her white Volkswagen Jetta; I was 12 y.o. and I just had the most wonderful vacation. And of course (to close with a happy memory) every song that Chris has played live since 1993 (my first concert) takes me back to the concert where I heard that song live the first time (e.g. when listening to Julia I often think about the concert at Utrecht Vredenburg in 1998 when I heard this song live the first time). So, is there only three persons with this kind of memories, come on people ??? I will give two more memories. 2. Album Deltics. Back in those 1996/1997 times I also found chinese food, sometimes I went out to eat it. Come on people, don´t be so boring ! that´s not the point with the forum. Or are you telling that you got no memories including songs or albums of Chris Rea? Mr_Blues wrote: Come on people, don´t be so boring ! "Nothing to Fear" was the first song that I heard Chris play in 1998 (I think) and it still makes the hairs on my neck tingle when I hear it. The stage was totally dark apart from the spotlight on Chris as he played the slide intro and I was absolutely spell bound. The sound was like nothing I had heard before and really started my love of Chris's slide playing. I have seen him many times since but those first few magic minutes will always stay with me and when I hear "Nothing to Fear" I'm always back in that London theatre in 1998. Hi Kev I can just imagine the moment as that is an amazing piece of music and one of my favourites. My first recollection of hearing Chris is nowhere near as dramatic or memorable but still remains as a special moment for me. I was at a summer BBQ with friends and in the background the song "On the Beach" was playing in the background. It was a lovely balmy summer night, in the company of good friends and from the moment I heard that song I was hooked. I went out out bought the tape (no CDs in those days) and whenever I hear this song it takes me back to that time with my good friends. When I did my military service in Germany in 1993, Espresso logic was released. I was an avid fan of Chris Rea since 1990 and bought every release of him - more than that i tried to get the old 12" vinyls from the early 80s. But back to the topic - I didn't expect a new CD as TOO MUCH PRIDE was just released in July/August 1993. So I went through some lousy times doing my duties for the German Bundewehr. And then out of nowhere was this new song by Chris Rea presented by the local radio station (which was called SWF3 - maybe some fellow Germans still know this station) - at first I didn't recognise any Chris Rea similarities. Just some drums and nothing else...but after the intro I knew that i would like the rest of the album as much as I enjoy teh song JULIA. Shortly after the release of Espresso logic a mini tour was announced and I was very lucky to attend to the Cologne concert - it was awesome!!! And so everytime I listened to Espresso logic (the album) I think of the days back in 1993/94. It was all in all a great time...and it is still a very good album. It probably isn't the most well-known song from Chris. It's a instrumental number from his album Dancing With Strangers. My wife Ingrid and I played this album very often in 1988, when she was pregnant from our second son. After giving birth, she had to stay in bed for a few days and then she played this song very often. And every time since that period in may 1988, when we played Danielle's Breakfast it touched her. Six years ago she was struck by breast-cancer. And in May 2016 it was clear she did not have a long time to live anymore. She made a list of songs she liked to be played at her funeral. Amongst others she wanted that we played "Danielle's Breakfast"
Last edited by gjvg on 25 Dec 2016, 19:09, edited 1 time in total. Thank You for sharing what must be a very difficult memory ! What a beautiful memory. Music and giving birth can be strongly related. Had that with my eldest daughter and Eric Clapton his song Tears in Heaven. Our daughter died three months after her birth. That song is an ode to her life. I wish you strenght for today gjvg.